For the complete Datsun redi-Go 1.0-litre review with images click here. 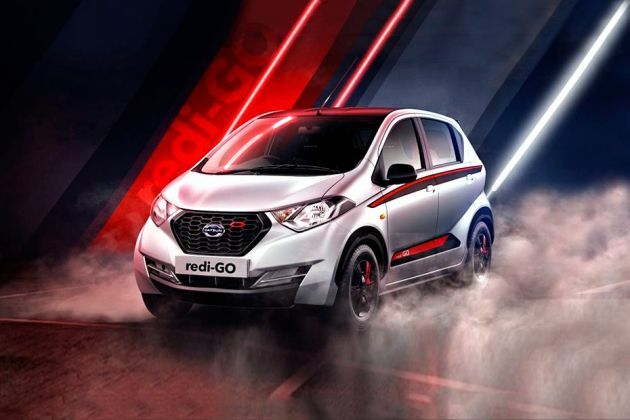 With the Redi Go being the most successful nameplate for Datsun in India, the carmaker has gone ahead and introduced a more powerful variant of the humble hatchback to attract a wider audience. The engine is now a three-cylinder, 1.0-litre unit, which is a bump up of 200cc from the standard redi-GO with the 0.8-litre motor. The same update was given to the Kwid as well last year. The question, though, is, does the increase in power make it a better and, perhaps, more fun-to-drive car? Here we go! On the outside there is nothing new barring the '1.0' badge on the boot to distinguish it from the 0.8-litre variant. It would have been nice had Datsun offered some more differentiating bits like dual-tone colours (going by the latest fad), body-coloured mirrors, or even decals (like the chequered flag on the Kwid 1.0-litre) to give the redi-GO 1.0L a distinct identity and more value to its buyers. Nonetheless, the car looks quirky with its tall boy design blended with sharp lines and bulging body panels. The design is a little 'hatke' than the usual boxy styles you see in this segment. At the front is the signature Datsun hexagonal grille flanked by a large set of headlights. The bumper has strong angular lines and houses daytime running lights, which is unique to the redi-GO in this segment. The edgy styling continues to the side, marked by a thick crease running from the lower half of the doors and rising all the way up to the boomerang-shaped tail lights that kinks to the side. The wheels are still 13-inch steel rims with wheel caps, an opportunity missed by Datsun to add a set of alloy wheels. At the rear, the high rear windscreen and tall bumper give it a raised stance, making the high 185mm ground clearance evident. However, this makes the boot lid sit quite high which becomes a hassle when loading heavy luggage. Also, the 222-litre boot sits deep and has a large loading lip, making it tricky to load/remove heavy luggage. Overall, this is a design that is still fresh, funky and offers something new to anybody looking for something different among entry-level hatchbacks. Inside, the redi-GO 1.0L gets all-black interiors. This is identical to the Sports variant of the 0.8-litre redi-GO, minus the body-coloured accents on the AC vents and steering. If you play 'spot the differences' you will notice that the lock/unlock switch on the centre console is new, and, apart from central locking, you also get a remote key. The boot, though, can only be opened using the release next to the driver seat. All other features and components like the steering, instrument cluster, music system and the gear lever are exactly the same. Overall, the black interiors mixed with the exterior body colour touch on some of the side panels look better than the grey ones in the 0.8-litre version. Space inside the car is sufficient for four average-sized adults but the rear bench wont be comfortable for a third passenger, not even a kid. At the rear, taller passengers may struggle for legroom but never the headroom, thereÃ??Ã?Â¢? ?s plenty of it and the fixed rear headrests are tall enough to support passengers of varying heights. The front seats offer just about enough support for your shoulders and while the backrest is large, the lack of lateral support will take its toll on long drives or through sharply curving roads. The seat base, though, is comfortable, with decent under-thigh support. The quality of materials used inside the cabin still remains questionable. The plastics are hard to touch and the fitment quality is just about acceptable. Storage spaces inside are ample with cubbyholes on the driver and passenger side and below the centre console. There are cup- and bottle-holders in front of the gear shifter but the door pockets (front only) are good enough to hold only magazines or perhaps your wallet. Lots of storage spaces are no doubt a great thing, especially in a small car like this. However, while driving, objects placed here tend to get tossed about and when they hit the hard plastic trim, they create a fair amount of rattling. This will make you pick everything up and keep them in the glovebox, and thats when you realise how small the glovebox really is. Use it to keep the vehicles documents and theres negligible room left for much else. Cabin insulation of the redi-GO is average at best with most of the noise from the suspension and engine seeping inside the cabin. We drove through-rain lashed roads and there was a fair amount of splashing heard through the wheel wells too. The feature list on the Datsun redi-GO 1.0-litre is short but not so sweet. The bigger engine is available with the T(O) and the S variants only. A good thing here is that the redi-GO 1-litre comes with remote keyless entry, which is commonplace in today's cars but is missing from the 0.8-litre variant. Other than that, everything else stays the same. You get a large analogue speedometer along with a small digital screen for the odometer, rev counter and fuel level. Additionally, it also displays range and trip information. The centre console holds a music system which has AUX, USB, CD and radio player. The lack of Bluetooth connectivity is a big miss. Users will still have to pair their smartphones via an aux cable or buy a USB Bluetooth adaptor. The front power window switches are located on the floor panel near the gear shifter, which take some getting used to, and the rear seats get manual window rollers. As before, the hard plastic rear parcel tray is still an accessory. This is where the meat of the matter is. The bigger 1.0-litre engine produces 68PS of power at 5,500rpm and 91Nm of torque at 4,250rpm. This is 14PS/19Nm more than the standard redi-GO and identical to the Renault Kwid 1.0. The increase in power, though not perceivable in an outright manner, becomes evident while tackling inclines or when travelling with a full house. Compared to the 0.8-litre variant, this car feels a lot more refined. Getting a move on is quicker and smoother as well. Engine vibrations can be felt inside the cabin, but are better controlled than in the 0.8-litre variant. What has noticeably improved is the in-gear response. With its healthier mid-range performance, the car manages overtakes and inclines better than the less powerful redi-GO, while reducing the need for downshifts. The car managed to take on a few sharp inclines with two passengers in third gear with the engine showing no signs of strain. In the redi-GO 0.8, such inclines would certainly have to be taken in a lower gear. The claimed fuel economy is 22.5kmpl, which is expected to be close to real-world numbers as it has been tested according to the new ARAI regulations. According to this method, the claimed mileage of the 0.8-litre redi-GO has dropped from 25.17kmpl to 22.7kmpl. So practically, you don't lose out on fuel economy if you go for the 1.0-litre option. Overall, the redi-GO 1.0-litre is definitely a nicer to drive than the 0.8-litre and, importantly, the benefits can be felt in everyday driving conditions. While driving at slow city speeds, the steering feels light and the car is nimble and easy to manoeuvre. But as speeds increase, things start to change. Though the Datsun redi-GO 1.0 gets to the 100kmph mark easily, we suggest you remain in the double-digit zone. The feedback from the steering is shallow and it's more of an instinct than surety while taking turns at slightly higher speeds. At triple digits, the tall frame of the car makes it a little difficult to steer without hints of body roll creeping in. The brakes also lack bite and it's difficult to find the correct spot to get maximum stopping power without locking the wheels. This is where the omission of Anti-Lock Braking System (ABS) really starts bothering. Suspension setup of the 1.0-litre is on the stiffer side, same as in the 0.8-litre version. It does not let the cabin unsettle and offers a fairly controlled ride on undulations. Bad roads are managed quite well but sharper bumps and potholes will be felt in the cabin. changes in the Datsun redi-GO 1.0-litre are primarily mechanical and enhance the driving experience. The bigger engine improves driveability and makes it better to use in everyday conditions, while (at least on paper) causing no real reduction in fuel efficiency. It is still among the more stylish looking entry-level hatches, offers decent space and comfort, and comes with attractive after-sales packages as well. Yes, it does miss out on some much-needed features such as Bluetooth connectivity, a passenger airbag, ABS, alloy wheels or, like in the Kwid, an AMT transmission. But if Datsun manages to price the redi-GO 1.0 under Rs 3.6 lakh, we would recommend it over the standard redi-GO. A premium of Rs 25,000-30,000 would be well worth the money given the difference you would enjoy with its improved driveability. డాట్సన్ redi-GO 5 వేర్వేరు రంగులలో అందుబాటులో ఉంది - Silver, Lime, White, Ruby, grey. డాట్సన్ రెడిగో చెన్నై లో మళ్ళీ పట్టుబడింది. డాట్సన్ రెడీ-గో కంటపడింది: రెనాల్ట్ క్విడ్ తో డాట్సన్ బ్యాడ్జింగ్!